RSPCA Case Study | Eptica - Multi Channel Customer Interaction Software. Email Management. Web Self-service. Live Chat and Agent Knowledgebase. 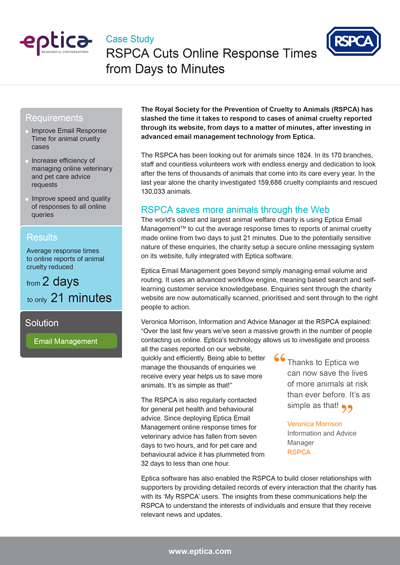 The Royal Society for the Prevention of Cruelty to Animals (RSPCA) has slashed the time it takes to respond to cases of animal cruelty reported through its website, from days to a matter of minutes, after investing in advanced email management technology from Eptica.